McALLEN, Texas — Facing dozens of migrants shackled at their waist and ankles, public defender Miguel "Andy" Nogueras asked a question he had rarely asked before last week: Have you been separated from your children? "Five years old," Nogueras told NBC News. "What kind of scars are we creating? The child has to be asking, where's my mom? And that kid has to be scared. I can't even fathom." The Trump administration's willingness to take children from their parents has raised concerns about how far authorities should go to stem unauthorized border crossings and what human cost is acceptable in the name of border security and immigration control. "There is something terrible happening here that Americans would not support if they understood it," said F. Scott McCown, director of the Children’s Rights Clinic at the University of Texas at Austin School of Law. Nogueras repeatedly used a single word when he described how those parents have responded: "anguish." "Wouldn't you feel anguish if they took your kids? I'd be going crazy. It's inhumane," he said. Other attorneys and advocates have reported similar torment among immigrant parents. “One of my lawyers came back from meeting his new client at the jail — and this is a very experienced criminal defense lawyer — who was shaken by the experience of talking to a parent whose child was literally ripped from their arms,” said Maureen Franco, a federal public defender for the Western District of Texas. “The human cost of this will be great,” Franco said. When Border Patrol locked her up in a holding cell for five days, Karen Hernandez had one big fear. “I was afraid they’d come and take my children. They had said the laws are going to change and they are going to separate the mothers from their children,” said Hernandez, who crossed from Mexico into South Texas via a navigable section of the Rio Grande with her son, Jaero, 13, and daughter Susan, 8. Hernandez, though, was lucky. She was caught before the new zero-tolerance policy fully went into effect, and so she was released May 10 with an electronic bracelet clamped to her ankle and her children at her side. Along with dozens of other migrants, she was taken to the Catholic Charities Rio Grande Valley Respite Center, where families can get a hot meal and clothing. Earlier this month, the center was filled with the noise of children who played together in a corner of the room with their parents nearby. The scene was a stark contrast to what most families will face under the new criminal enforcement policy. When parents are held for prosecution, their children are turned over to the Office of Refugee Resettlement, part of the Department of Health and Human Services. 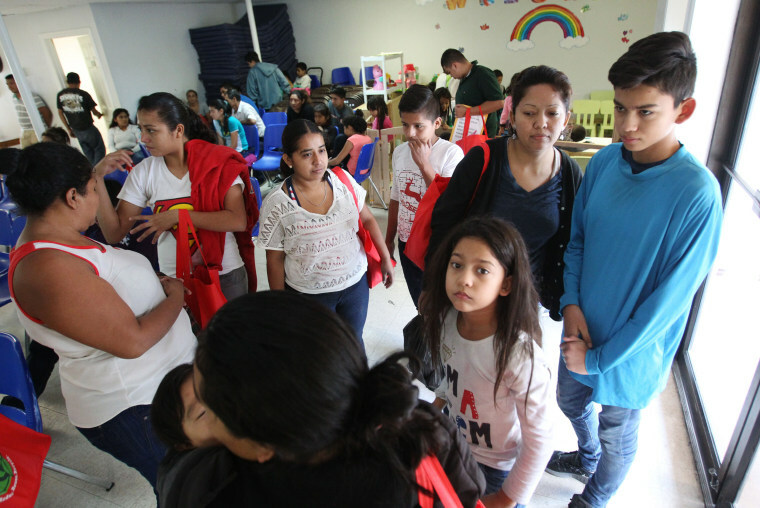 The children are then designated as "unaccompanied minors," and the government tries to connect them to family members who are already in the U.S. Until then, children wait in shelters or are sent to federally contracted foster homes, often without parents being told exactly where they are, immigration advocates said. It may soon become even more difficult to place children with relatives. The Department of Homeland Security is proposing immigration checks be done on all people in a household who may take in these "unaccompanied" children, which means relatives who are undocumented may be less likely to come forward. In the meantime, space in shelters and foster homes is limited; The Washington Post reported the administration plans to open facilities at military bases to house some of the separated children. DHS tested its new policy for 26 days last October by prosecuting all adults who crossed into the U.S. illegally in the El Paso sector of the border. There was a brief drop in the number of arrests of people crossing the border in that area during and immediately after the test, but numbers began rising again in February. Trump administration officials have said the purpose of the new zero-tolerance policy is not explicitly to dissuade families with children from crossing into the U.S. illegally, but rather to protect children from kidnapping and smuggling and to more strictly enforce existing laws. “We don’t want to separate families, but we don’t want families to come to the border illegally and attempt to enter into this country improperly,” Sessions said this month in announcing the policy. "I want to be clear," added Thomas Homan, deputy director of Immigration and Customs Enforcement, at the same announcement event. "DHS does not have a blanket policy on separating families as a deterrent." Advocates and attorneys said the administration is forcing migrants fleeing perilous situations into a "Sophie's choice" over what's best for their children. Franco, the public defender in west Texas, said the policy could encourage parents to plead guilty to improper entry just to get their children back. “This has some constitutional ramifications. How voluntary could a plea be if someone feels they have to plead guilty to be reunited with their children?” Franco asked. The American Civil Liberties Union has sued over the family separations and sought an injunction to stop them and is awaiting a ruling. The lawsuit doesn't challenge the prosecution of the parents, just the family separations. In affidavits filed with the lawsuit, parents tell of monthslong separations without knowing where their children are or how they're faring. A woman identified as Ms. G said in an April 23 affidavit that she was separated from her blind 6-year-old daughter and 4-year-old son after crossing at Nogales, Arizona, where the family requested asylum. Her children are living in a shelter more than an hour away from where she's being held. “I worry about them constantly and I don’t know when I’ll see them,” she said. Gelernt has seen cases in which parents are separated from their children even if they cross into the U.S. through an official port of entry, which authorities have said should protect families from being split up. A man identified as Mr. U from Kyrgyzstan said in an affidavit he and his 13-year old son were separated when they sought asylum at the San Ysidro Port of entry. Mr. U was held in California; his son was sent to Chicago. “All I can remember is how much my son and I were both crying when they took him away,” Mr. U said. Several immigrant rights groups and asylum seekers sued DHS and Customs and Border Protection for turning away asylum seekers at ports of entry last year. The suit is pending. Few migrants who were at the Catholic Charities Rio Grande Valley Respite Center earlier this month knew about the family separations. But when told about them, several parents said they wouldn't take the risk of losing their children. Still, she doesn't think she would have crossed into the U.S. if she'd known about the new zero-tolerance policy. Suzanne Gamboa reported from McAllen, and Daniella Silva from New York.